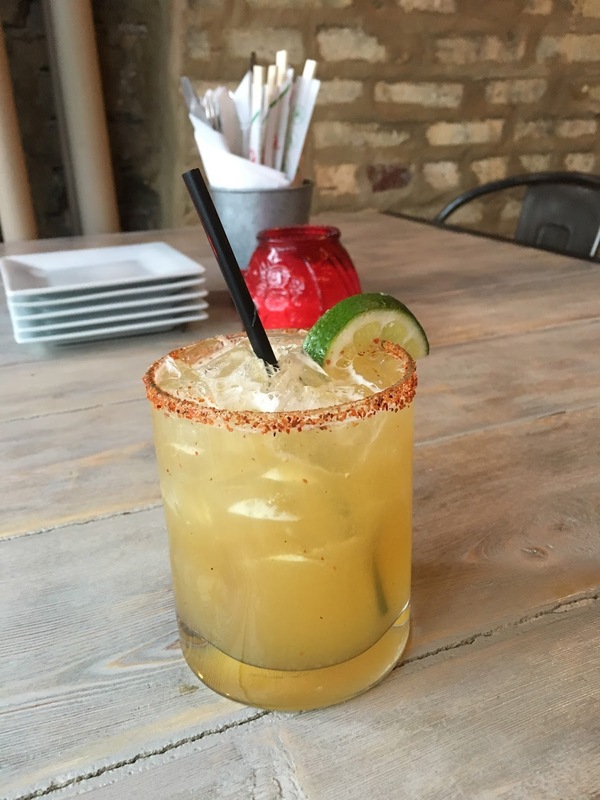 Rojo Gusano, (“red worm”) a Mexican spot in Albany Park is making waves for good reasons. The spot is helmed by Chef Dudley Nieto, a Mexican restaurant vet that was brought in to open up a casual and eclectic restaurant with the Morenos family who purchased the restaurant space. The restaurant is a shiny storefront on a stretch of West Lawrence that features a McDonald's, a barber shop, and countless other local stores. Needless to say, it stands out. I stopped by with my +1 Shelley on a Monday night and the place was actually pretty crowded. The restaurant makes you feel like you’re in California, it’s bright, open, and features a large garage door in the front, as well as a surfboard on the wall. The owners completely revamped the space which used to house Mexican restaurant Mayan Sol, even stripping away the walls to reveal exposed brick. 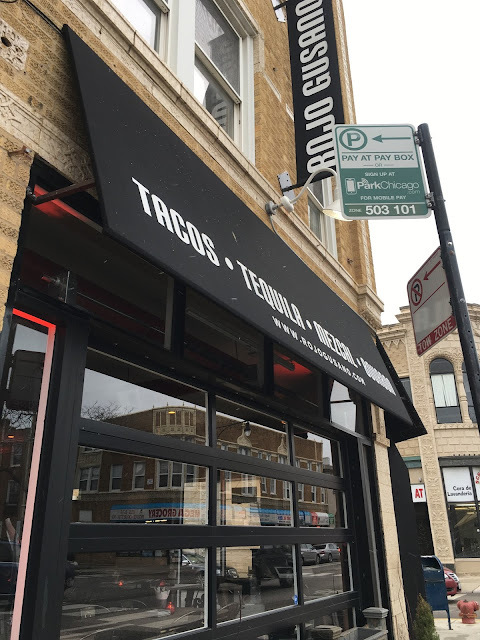 They also tap into the Albany Park community, offering discounts for neighbors, as well as movie nights, and encouraging patrons to bring in a sticker for their “sticker wall” for 10% off their meal. It’s a cool space, that makes you feel welcome the moment you walk in. As far as the menu goes, the drink list relies heavily on mezcal and features several mezcalitas, as well as bottled beers, and pours of tequila, mezcal, and bourbon. Looking for a strong cocktail? Rojo Gusano has you covered. 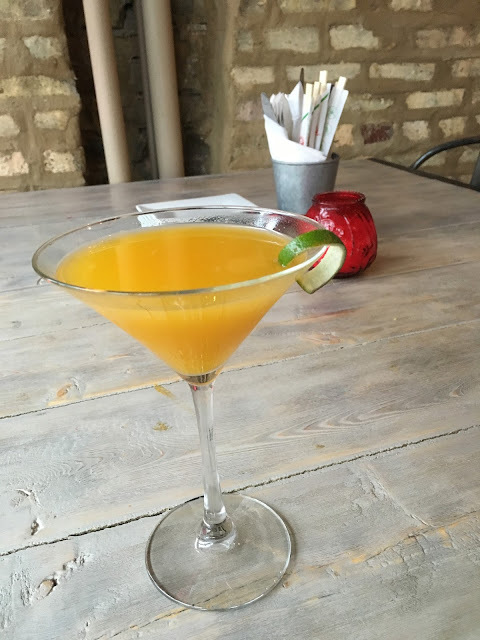 The Mango Beach featured mezcal, sweet vermouth and mango puree, served in a martini glass. The drink was on the sweeter side but I didn’t mind because I loved the mango puree so much. The mezcalita was less sweet, mixed with mezcal, lime, and agave nectar. 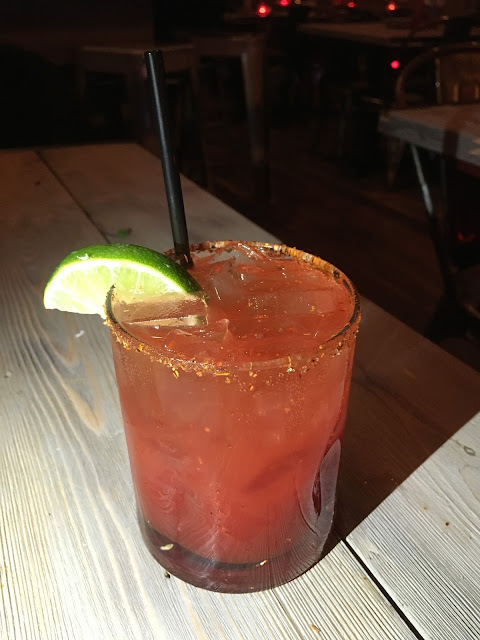 We also tried a new cocktail coming to the menu called Chipotle Passion which was a spicy drink with mezcal and mango. The food menu is just as extensive. The best course of action is to order across the menu and share each dish. 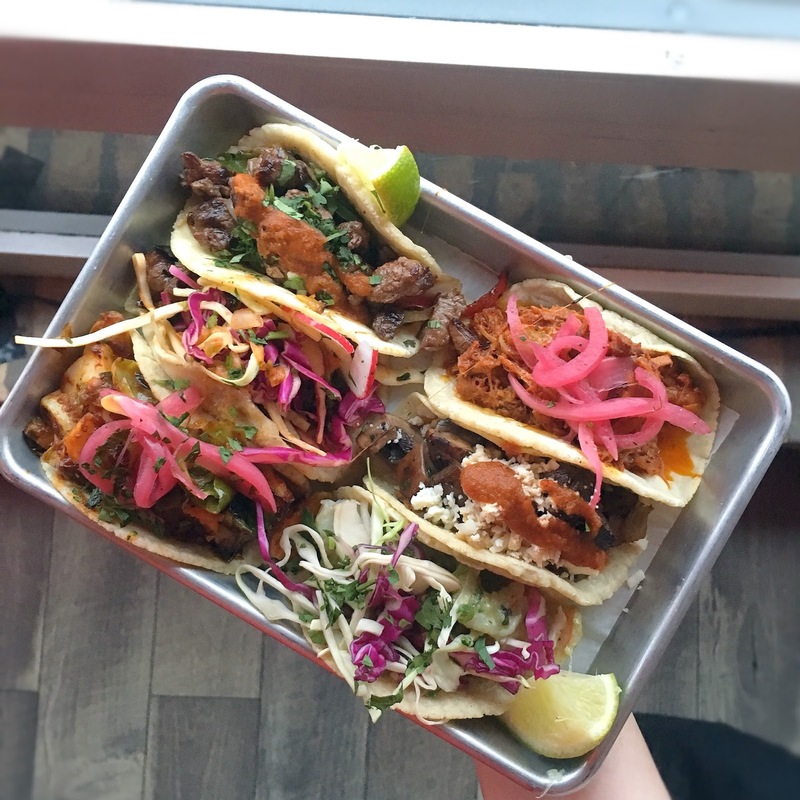 From house made guacamoles and salsas, ceviches, salads and soups, to tacos, bowls, and smaller plates like empanadas and quesadillas, you’re going to want to order a lot. Good thing for you, we did just that. The guacamoles were more like mashed avocado topped with various toppings, which we didn’t love. We both agreed the texture of each was a little on the soft side and could have used some cilantro. It just didn’t seem like guacamole, more like an avocado dip. The salsas fared a bit better, and we were partial to the Thai and habanero salsas. We didn’t find any of them to be terribly spicy though (we love spicy food!). The Thai salsa is just one example of the subtle Asian influence on the menu which features Thai and Korean flavors. Next up was the octopus and shrimp ceviche which had a Peruvian twist with aji amarillo tamarind leche de tigre, red onion, cilantro, sweet potato, and toasted corn. The seafood was fresh and well prepared but I thought it could have used more acidity overall. It was more on the sweet side due to the tamarind leche de tigre. 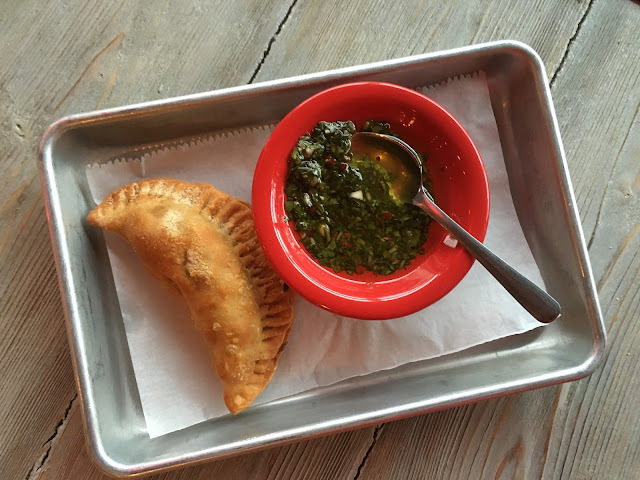 From the small plates menu section, we tried the empanada portobello per our server’s recommendation. This ended up being one of my favorite items of the evening. The crispy dough was stuffed with farmer’s cheese, epazote, and portobellos, with a side of chimichurri. The mushrooms and filling overall was very tasty. The tacos were presented beautifully on a tray and were so colorful with all of their toppings. Rojo Gusano makes their own tortillas, and you could really tell. Each had a thicker, smoother texture than store-bought tortillas, and sopped up much of the grease of the tacos. My favorite tacos included the green curry shrimp, pork, and mixed mushrooms, which I felt packed the most flavor. Make sure to grab extra napkins because these tacos are messy! We finished our meal with both desserts on the menu, because ¿Por Que No? The first was chef Dudley’s chocolate tamale, a Mexican and Belgian chocolate cake served inside a corn husk with vanilla bean ice cream. The cake smelled incredible, but unfortunately was on the dry side. However, our other dessert, the house churros made up for it. The homemade churros were so light and crispy, and not at all greasy. They were like little fried pillows. The churros are served with two dipping sauces on the side, raspberry, and chocolate bourbon. I could definitely taste the bourbon in the chocolate sauce which instantly made it my favorite. To wrap things up, I definitely think Rojo Gusano is worth a trek to Albany Park. The restaurant has such a fun vibe (they were blasting techno and the Beach Boys), and it’s going to be even better once the weather warms up and they open their front garage doors, and sidewalk cafe. I can appreciate the variety of menu items, and mixed international flavors, but I do think some of the food could have been improved. I will say, a meal at Rojo Gusano is extremely affordable and the passion the staff have for the restaurant shines through. As an FYI, they also serve weekend brunch from 11am-3pm on Saturday and Sunday. 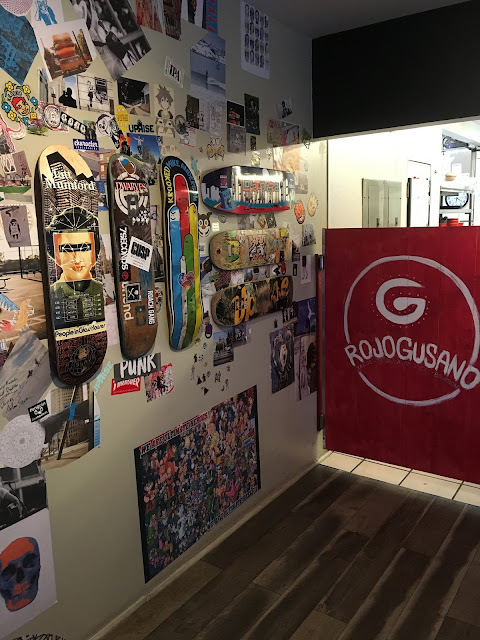 Lastly, just this week, Rojo Gusano announced it is opening a second location at 3131 N. Central Ave (Central and Belmont) that will be about half the size of the original restaurant. Note: my meal at Rojo Gusano was complimentary; however all opinions are my own. I love being mentioned in this post! :) I really enjoyed our meal, but their brunch this past Sunday knocked it out of the park. That's what I'll be returning again and again for! And hopefully with you!